World of Warcraft Illidan is a former night elf. As stated by Maiev Shadowsong, he is now neither demon nor night elf, but something more. He is the twin brother of Malfurion Stormrage, and was (perhaps still) in love with Tyrande Whisperwind. He was once an unusually gifted Sorcerer, but exact powers today are difficult to classify. His desire for power and arcane mastery has led him to a number of horrific acts against his own people and all the races of Azeroth, from defecting to Sargeras to daring to recreate the Well of Eternity. 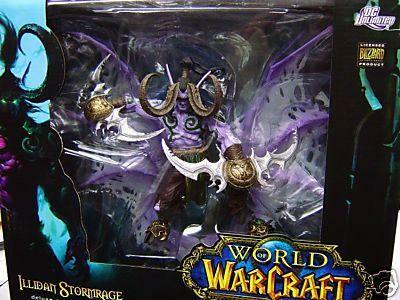 For his actions, he was imprisoned for ten thousand years, until his release almost a decade ago.Illdian Stormrage Deluxe Boxed Collector and Action Figure, licensed by World of Warcraft and Blizzard is available here!